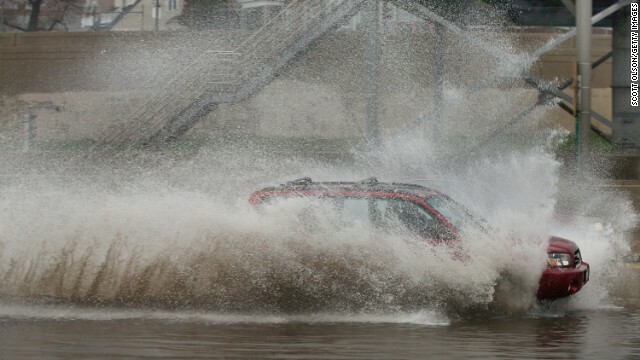 A motorist drives through a flooded section of the Kennedy Expressway last week in Chicago. A powerful spring cold snap brings more rain and snow to a soggy U.S. heartland Wednesday, putting more pressure on riverside communities from the upper Midwest to the Deep South. The residents of Grafton, Illinois, north of St. Louis, will see the worst of the floodwaters through Friday as the Mississippi River peaks at more than 11 feet above flood stage, the National Weather Service says. Many along the river's edge decided to evacuate. But Jerry Eller thought he would wait it out. "I've got water coming up through cracks in the floor, so I have about 3,000 gallons an hour of pumps running down the basement keeping water out, and that seems to be keeping it down to about an inch," Eller told CNN affiliate KPLR. My condolences go to the families that lost their loved ones....sorry. Is this gawd's juddjmint on them? What did they do this time? They lived on a floodplain. Gawd hates floodplains.